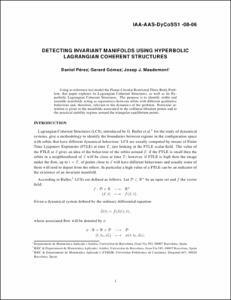 Pérez, D.; Gómez Muntané, G.; Masdemont, J.J. Detecting invariant manifolds using Lagrangian coherent structures. A: IAA Conference on Dynamics and Control of Space Systems. "Final papers". Porto: 2012.